John O'Donohue, beloved author of To Bless the Space Between Us, is widely recognized as one of the most charismatic and inspirational enduring voices on the subjects of spirituality and Celtic mysticism. These timeless exchanges, collated and introduced by Quinn, span a number of years and explore themes such as imagination, landscape, the medieval mystic Meister Eckhart, aging, and death. 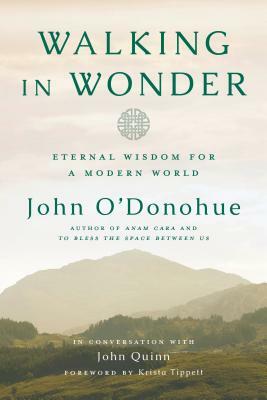 Presented in O'Donohue's inimitable lyrical style, and filled with rich insights that will feed the "unprecedented spiritual hunger" he observed in modern society, Walking in Wonder is a welcome tribute to a much-loved author whose work still touches the lives of millions around the world. JOHN O'DONOHUE was a poet, philosopher and scholar, a native Gaelic speaker from County Clare, Ireland. He was awarded a PhD in Philosophical Theology from the University of Tübingen, with post-doctoral study of Meister Eckhart. John's numerous international best-selling books: Anam Cara, Beauty, Eternal Echoes, and the beloved To Bless the Space Between Us, among many others, guide readers through the landscape of the Irish imagination.